Boots is a large male St. Bernard mix. He was surrendered by his new owner because he was too big for their trailer. He is housebroken and loves children. He does have severe flea allergies, and a lot of hair loss on his sides because of this, so he will HAVE to be kept inside or he will freeze. He's a beautiful dog, and just needs a bit of TLC to get him back to looking wonderful. 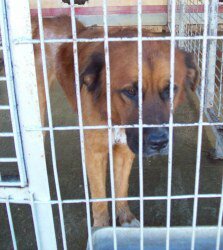 All animals at this shelter are VERY URGENT!!! PLEASE DO NOT CALL THE SHELTER TO INQUIRE ABOUT A PET UNLESS YOU ARE SERIOUSLY INTERESTED IN ADOPTING IT! All information that is known, is listed. We do not have information regarding vaccinations, housebreaking, good with kids, good with cats, etc, unless stated in the posting. NO PULL FEE FOR RESCUE GROUPS!! You must agree to Spay or Neuter your new pet and provide proof to the shelter within 30 days. Why are the pets free? We understand that there are a lot of initial expenses incurred when you get a new pet including; Spay/neuter, vaccinations, general health exams, flea and heartworm prevention, obedience classes, food, dishes, collars, leashes, toys and beds to name just a few. We want you to be able to provide your new pet with everything that they will need right away! The most important thing to us is that these precious pets get into a great home as quickly as possible. Any known information will be posted. If no information is posted then the history is unknown. We welcome out-of-county and out-of-state adoptions, however we can not assist in transport. Please remember that the staff is not able to guarantee a hold on an animal. Most animals come from unknown sources, therefore we can not guarantee the health or temperament of any animal. PLEASE, NO phone calls from 9:00 pm to 9:00 am!!!! When calling, expect a general answering machine (it does not say Jay County Animal Control). Please leave a brief message describing the pet you are interested in adopting, and we will return your call as soon as possible. This is a very small operation, please be patient. If you are calling long distance, please be sure to check back, as long distance calls are not returned unless they sound seriously interested in adopting a pet. "We have a ChipIn set up to go towards neutering the Jay County A/C shelter pets, and you can specify who you want it to go to, if you wish. We've gotten several spayed/ neutered from donations, and it helps with their adoptions and transports... Please go here if you'd like to help: http://www.facebook.com/l/156c4;jaycountyanimalcontrol.chipin.com/jay-county-animal-control-pet-fund"